Here are five of the craziest potholes in North American automotive history and just a few of the problems they caused. This is more than a pothole, if we’re honest, and is more of a sinkhole. It’s a subtle difference, but an important one. A sinkhole is formed by a depression deep under the ground, while a pothole is basically the same process at a surface level. So when a sinkhole opens up, the results can be catastrophic. General Motors Co. found this out to its cost when a sinkhole opened up right under the Corvette Museum’s Skydome in Bowling Green, KY. Eight cars were swallowed up and the CCTV footage from inside the museum is mesmerizing. This drone footage of the aftermath is equally surreal. GM had to repair two sinkholes at the facility as they threatened the very structure of the building. It’s crazy that a pothole could actually become a tourist attraction, but this 42 ft.-by-24 ft. monstrosity was discovered in 1884 and dates back to the last ice age. 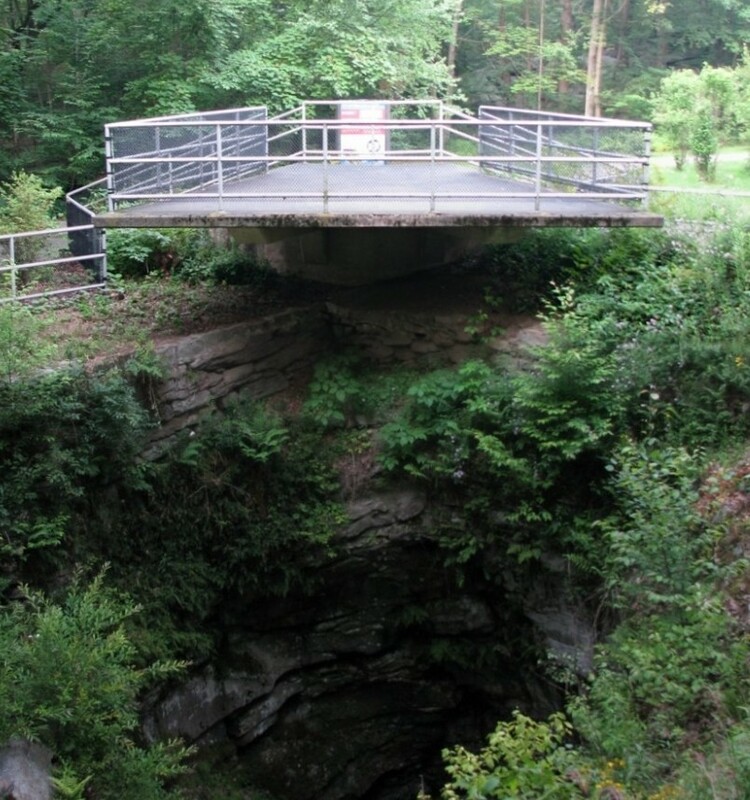 It is now the focal point of the state park in Lackawanna County. Thankfully, you can’t hit this 38-foot-deep pothole with your car. It’s safely fenced off and away from the road, but this hole in the ground would leave a little more damage than a buckled wheel. This isn’t one pothole. A 2016 study by TRIP revealed that Oakland is the most potholed urban region in the U.S. In fact, the study found that the three worst regions for potholes are all found in California. This goes against conventional wisdom that potholes result from savage changes in temperature and harsh winters followed by heating and cracking in the road surface when the weather changes. The transport research group found that 71% of San Francisco and Oakland’s roads were simply sub-standard and laid the blame on poor maintenance that allowed minor problems to develop into serious issues. Cyclists suffered just as badly as drivers and they have taken to painting elaborate warnings round the worst potholes, including pictures of injured people on the ground and full-blown art installations. It’s a comical response to a serious issue and claims by motorists for pothole damage are on the increase. Again, the sheer volume of potholes brought the downtown Detroit area crashing in to this Hall of Shame. But this monster on the I-75 freeway stands out even in this company. An entire section of bridge fell through and this hole in the ground claimed 20 four-wheeled victims before it could be fixed. Detroit does have to deal with intense winters and frozen ground, which then moves and cracks when the ice and snow thaws. The end result is total chaos. Detroit's The Metro Times argued that Mount Road has more craters than the surface of the moon, and featured this compelling video (above) to prove its point. One intrepid reporter spent a week analyzing the state of the roads in Indianapolis. He named a hole in the White River Bridge as his "winner." This pothole wasn’t as dramatic as the one in Detroit in terms of scale, but it did have a three-foot spike of metal rebar sticking out of it. This metal reinforces the concrete, when it’s there. When it isn’t, then the rebar is simply a spear that can cut through tires, suspension and a car’s front end. Again, he blames a lack of maintenance as the reason for the literal collapse of the road network in Indianapolis. It’s easy to see how why the local residents are putting in massive claims for damage to their cars.